The newest card revealed from The Boomsday Project might be the most wonderful art revealed in a long time—but its effect also looks pretty powerful. The Boomsday Project is Hearthstone's next expansion, and card reveal season is well and truly underway now. 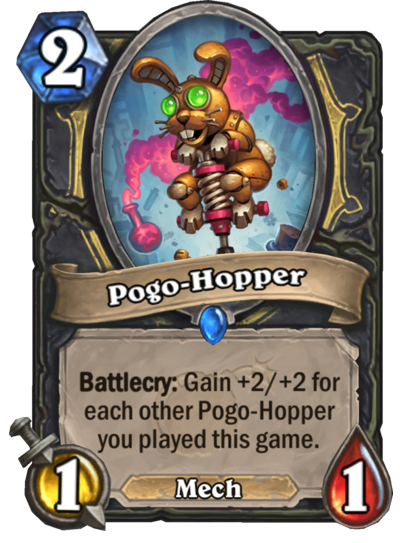 Pogo-Hopper is a two mana 1/1 Rogue Mech minion. It might start as a 1/1, but it can grow pretty fast—when it's played, it gains +2/+2 for every other Pogo-Hopper you have played so far this game. It of course took players about two seconds to remember that Lab Recruiter was revealed in Monday's kickoff stream. That card shuffles three copies of a friendly minion into your deck. See where we're going with this? That's right—infinite Pogo-Hoppers. Pogo-Hopper combos have definitely shot to the top of the list of new things to try for a ton of players straight away. Expect to see it on ladder when the expansion goes live.